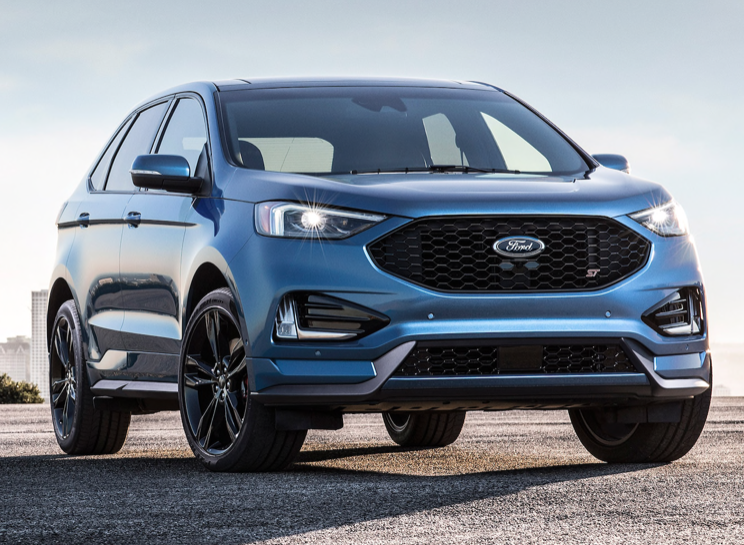 Perhaps it was only a matter of time, but Ford has created its first performance SUV with the 2019 Edge ST midsize crossover, which goes on sale this summer with a twin-turbocharged V-6 engine and a new look shared with the rest of the refreshed Edge lineup. Adding the first ST to the SUV lineup underscores, once again, that Ford is a truck company—a point it continues to punctuate with each new vehicle launch. The F-Series is its bread and butter, and the range is expanding with the addition of a diesel-powered F-150 coming this summer and the long-awaited Ford Ranger midsize pickup. Equally key are SUVs. Ford sold almost 800,000 SUVs last year and has no intention of slowing the pace. The EcoSport subcompact crossover is the latest new nameplate for Ford in the U.S., a new Explorer is in the works along with a Lincoln counterpart, and the newly named Lincoln Nautilus replaces the MKX. Ford’s first long-range electric vehicle will also be an SUV. As the truck side of the business expands, the automaker continues to pull back on cars. The Fiesta might soon be discontinued in the U.S.; China got a new Taurus, but the U.S. did not; the next-gen Focus will come from China; and future updates and production plans for the Fusion appear uncertain with a redesign planned for China in 2020 but not for North America. Ford’s new CEO, Jim Hackett, said he is reallocating $7 billion in capital from cars to SUVs and trucks. Some of that spending has gone to the Ford Edge, which gets a significant upgrade for the 2019 model. The Edge, which made its debut in 2006, was the brand’s first car-based unibody crossover. It was also the first to add a Sport trim level in 2009 and to have the MyFord Touch infotainment system in 2011, which would have been a much bigger honor if the system and touchscreen weren’t so buggy, creating quality issues that the brand spent years rectifying. But it does not take from the fact that Ford sees the Edge, with 2 million global sales to date, as a platform to test new things. Especially as the segment has grown 50 percent during the Edge’s lifetime and is projected to grow another 9 percent this year to 2.4 million, said group SUV marketing manager Michael O’Brien. So when work began about two and a half years ago on updating the Edge, the plans grew to include a performance version worthy of ST badging. The Ford Performance team added horsepower to the 2.7-liter V-6 EcoBoost engine, taking it to 335 hp from 315 in the 2017 Edge Sport. Torque is a healthy 380 lb-ft with standard all-wheel drive to handle it. Fuel economy numbers are not out yet, but the 2017 Edge Sport with this engine is rated at 17/24 mpg city/highway. The rest of the Edge lineup is equipped with Ford’s 2.0-liter EcoBoost four-cylinder engine. The direct-injection turbocharged engine gets 250 hp, which is an increase of 5 hp and 275 lb-ft of torque. The Edge will be Ford’s first use of its new eight-speed automatic transmission with start/stop, which was developed in-house. Ford developed the outgoing six-speed with General Motors, and the two partnered to make new nine- and 10-speeds that are slowly entering the market. New for the Edge family is an e-shifter with a rotary dial, freeing more room in the center console. When the vehicle doors are opened, it automatically goes into park. 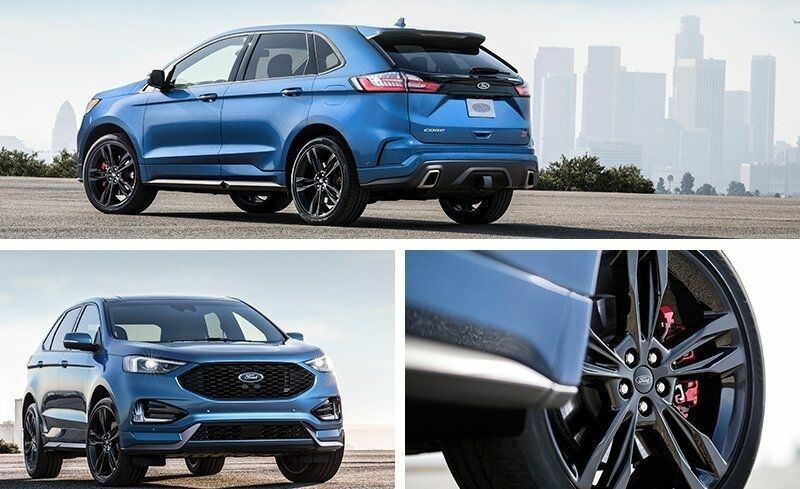 There are paddle shifters, which in the 2019 Edge ST are fully manual. The button for Sport mode is in the middle of the rotary shifter and changes the throttle response and shifting patterns to stay closer to redline—it rev matches the downshift in the apex and prevents upshifting on an extended corner. The exhaust note is louder; the engine braking is sharper. You can turn off the stability control or go into “relaxed mode” to slide the car around. Don’t worry about SUV’s tippier stance; roll control stability is always active. To earn ST status, the sport suspension was tuned for more damping, and the brakes are larger, especially if you opt for the performance brake package with exposed red 345mm vented rear rotors. In addition to the 20-inch wheels, there are optional 21-inch five-spoke wheels in gloss black, including the cap. Ford will offer a performance summer tire because Ford engineers fully expect some owners to take their Edge ST to the track. The thinking behind an Edge ST is that people will continue to move out of sedans and into utility vehicles, but not as many are moving out of performance cars, which suggests a reluctance to give up spirited driving. Hence, logic suggests a performance SUV hits a sweet spot. “People want an SUV but still want to drive aggressively,” vehicle engineering manager Jonathan Crocker said. Currently about 10 percent of Edge sales are the Sport—a trim level that goes away with the addition of the ST. Executives think the ST could capture at least as many 2019 Edge sales. Designer Steve Gilmore, who also worked on the 2015 Edge, wanted this latest update to look more confident and aggressive. It starts with a bigger grille—both higher and wider—fronting a hood that was brought forward. The LED headlamps were pulled to the corners for a greater sense of width. The optional LED foglamps are designed to work with the headlamps to create the image of a C.
For 2019 there are new colors inside and out: four exterior and three new interior palettes. There are also four new wheel choices, including 19-inch aluminum painted wheels on the Titanium. The Edge ST comes in an exclusive “Ford performance blue,” and the color extends into the lower bumper that is chrome on the regular Edge. The ST has blacked out hexagonal upper and lower grilles compared with the slats on the rest of the Edge family. The ST drops the chrome strip on the back of the regular models, and the dual exhaust tips have a unique square shape. Stepping inside reveals the “Ford performance”-emblazed sill plate, ST badging on the leather steering wheel, and the black leather seats with extra bolstering just for the ST.
On the safety side, there is a lot of standard equipment across the SE, SEL, Titanium, and ST, including hill-start assist, blind-spot monitoring with cross-traffic alert, auto high-beams, lane keep assist, and forward collision warning with brake support. Active park assist is an option. A new post-collision braking system stops the car from continuing to move after an initial crash. Also new is evasive steering assist, which helps you apply the right amount of steering to avoid a collision, a first for a nonluxury SUV, Ford driver assist technology manager Scott Lindstrom said. It will also be in the Lincoln Nautilus. The Edge also gets adaptive cruise control with stop-and-go functionality and lane centering to keep the SUV safely in its lane and at correct speed to not hit the vehicle in front. For 2019 the Edge family has an embedded modem and Wi-Fi to create a hot spot with a 50-foot range for the 10 devices that can be connected to it—guaranteed to make you popular at the soccer field. With the FordPass Connect app on your smartphone, you can locate, start, and unlock your car remotely. The car’s software also supports Amazon’s Alexa voice service, so you can talk to the digital assistant from your car. The Edge also has a 12-speaker B&O Play audio system from Harman that was tuned for the Edge. Titanium has features such as wireless charging and remote start. The Edge is built at the Oakville Assembly Plant in Ontario. Last edited by Skylab; 01-11-2018 at 09:27 PM. Here I was patiently waiting for a USDM Forester STi and Ford said "Wait no more". 600 lbs negates that extra dollop of sport and power...and wrong blue oval. Cool concept, but I ain't paying $40k for one. Incentives, discounts, rebates. Only a fool pays msrp. Exactly. This is a pretty impressive vehicle and if you can get one for mid $30's I think a very good value. The only thing that scares me is a Ford/Chevy sourced transmission. Both companies have had their challenges over the years with making reliable transmissions. The current GM A8 in the Corvette, Tahoe, etc has been having tons of issues. 4,400lbs, 335hp/380tq, 8spd auto only; does it have a drift mode? Although I have zero interest in this vehicle, Ford is playing to today's market; it will sell like hot cakes. It sure does look good, to me anyway. Fuel is cheap, and SUVs are hot again. This will sell well. Yeah, I get that, I've probably bought more new Fords than you have. That doesn't change the fact that Ford dealerships are notoriously shady when it comes to special editions/model lines. The Edge Sport starts at $40k and goes up from there so yeah, that's a fairly accurate price for the model that's supposed to replace it. You're simply not going to see the discounts on these that you see on the bargain basement models and Ford often excludes ST(and RS) models from factory incentives. A new post-collision braking system stops the car from continuing to move after an initial crash. Get out of the ****ing middle of the road! It's not bad! I can't! It won't let me! As a veteran of blue oval, your aware that you give it a few months and the heat is over, and the incentives are back. Granted there are cases like the Boss and GT350, but all the STs, and even the RS (at most dealerships) dropped to realistic prices. RS I would agree but I have seen some big discounts on Focus and Fiesta ST models in the past. Typically these discounts are not available for brand new models, but if you want a little bit they are available. But will they put the correct head gaskets in it? But what about the panel gaps? A bit on the heavy side but power numbers are nice. Obviously not the most critical spec in a sport vehicle like this but any towing info? Ford hopes the Edge ST will compete with the performance crossovers from Europe, and is charging accordingly. The Ford Edge ST was pretty polarizing when it made its debut in Detroit way back in January, given its lack of a manual transmission and the fact that it's a crossover. We will admit to being more than a little curious as to what Ford was planning on charging for the thing and now, thanks to documents secured by CarsDirect, we know. The Ford Edge ST gets a menacing black grille, bigger brakes and more power, but will it be worthy of the ST badge? The Edge ST will cost around $1,500 more than the Ford Edge Sport, bringing its total after destination to $43,350. What are you getting for those extra greenbacks though? Bigger brakes, sportier suspension and a 2.7-liter EcoBoost V6 engine that puts out 335 horsepower and 380 pound-feet of torque. 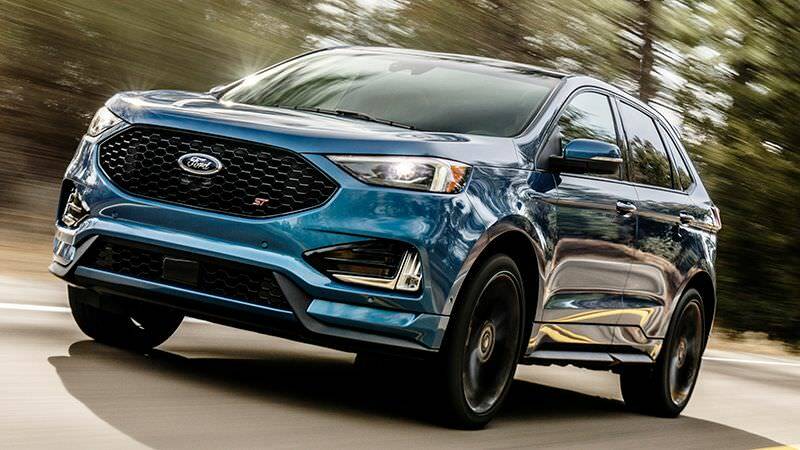 Paying over $40,000 for an American crossover is likely to make some customers balk, but Ford is adamant that the Edge ST will prove to be a real rival for sport crossovers from the likes of Audi, Mercedes and Porsche. Time's going to tell on that one though. The 2019 Ford Edge ST will go on sale later this summer. Only three weeks of summer left… I haven’t seen one yet. Too bad. It reads like the same review when the Fusion ST first came out: Overall just okay (especially when compared to the specs). Once it's blacklisted by the enthusiast crowd, I'm not sure who the buyers for it are... Ford will prob be giving these away in a few months. Assuming it wouldn't rollover in all of the reviews, that would actually make sense as far as marketing it.